Today, let us ponder about what exactly this Apache ANT is and why it takes its place as an important building block in the construction of a WebDriver framework. By the end of this post, you should be able to handle any ANT project in general. But with Apache ANT all these steps can be handled with a simple Target (we will see what a Target is, in a minute!). Everything to be achieved is specified in an XML file, in a structured and modular way making it very easy to identify if something breaks. And this file is known as the famous, “build.xml”. Apache ANT comes with a default buildfile named, build.xml. We can always edit or create a new XML file to suit our needs. This is basically a command-line tool. So, it is very easy to run Apache ANT from the command prompt using the command, “ant build_file_name.xml”. 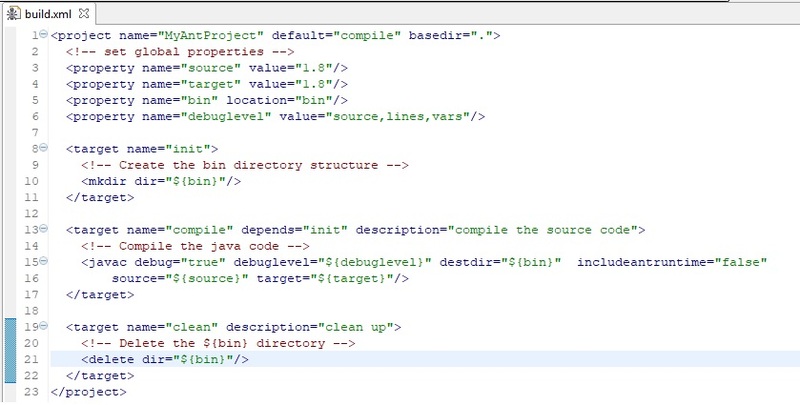 The best part here is, in case you did not rename the build.xml (just modified the provided default or created your own and named it build.xml), then just the command, “ant” would automatically know to look for build.xml and do what it is made for! Handle code from version control systems such as CVS, SVN etc. Execute JUnit tests, test scripts etc. And guess what, it sounds intimidating but every single thing that I have mentioned so far can be achieved with just the buildfile. Time to juggle with the elements of the much-hyped, buildfiles. These are written in XML. Let us distill the buildfile one tag at a time. Project: This has three attributes. Target: As shown in the sample buildfile, a project can have one or more targets. Target is a set of Tasks. We can select which targets we would like ANT to execute by their names separated by commas. When no target is specified, then the default target is executed. The important attribute to note here is “depends”. This specifies the target name that it is dependent on. For example, the compile target will execute only after its dependent, init target is executed. Thus, depends attribute specifies the order in which targets are to be executed. Task: This is a piece of code that can be executed. Each task can have one or more attributes as key-value pairs. name is the name of the task, attributeN and valueN are the attribute and value names respectively. Here is a long list of built-in tasks that come right out of the box. We can code our own tasks as well. (Remember? It is all written in Java). Step 1: Go to, ‘https://ant.apache.org/bindownload.cgi’ and click on ‘apache-ant-1.10.2-bin.zip’ to download the .zip file under ‘Current Release of Ant’. Step 2: Once the .zip archive is downloaded, extract all the files to a directory on your local machine. Right click on ‘Computer’ -> Properties -> Advanced system settings -> ‘Advanced’ tab -> Environment Variables -> Click ‘New’ under system variables. ANT_HOME is set to the path of the folder in which Apache ANT files are extracted. Similarly edit the Path variable to include %ANT_HOME%\bin. Click on ‘Finish’ to see an eclipse auto-generated build.xml file. And that’s it! You are all set to run your project as ANT build. It is laughably simple, isn’t it? Sticky Note: Eclipse comes integrated with ANT. 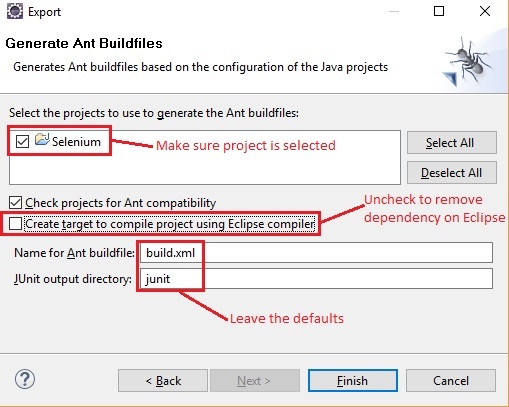 In order to make sure Eclipse’s ‘Ant Home’ points to the latest version of ANT, click on Windows -> Preferences -> Ant -> Runtime. Click on the ‘Classpath’ tab. Expand ‘Ant Home Entries’ and verify the path. If it is pointing to a different version, then click ‘Ant Home’ and browse the location of the folder in which Apache ANT files are extracted. In our next post let us do just that and generate a JUnit report with the help of an ANT target.